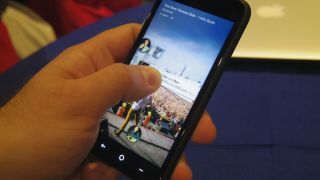 The new Facebook Home-optimised HTC First runs a stock version of Android Jelly Bean, which can be accessed simply by turning off the social network's new, custom UI, the manufacturer confirmed on Friday. The Phandroid site discovered that those seeking to use Android in its purest form can, ironically, achieve this by buying a phone designed to almost completely hide the Google-built OS from view. In its hands-on time with the device, as did TechRadar's in our hands-on review, Phandroid found that the Facebook Home skin can be completely disabled with one tap of the app's settings menu. It also found that the Android notifications bar, missing from the core Facebook Home experience, could be summoned through the same setting application, while still using Facebook Home. HTC later confirmed to The Verge that this was indeed the case and stock Android is the beneath-the-surface version of the OS. Why is this somewhat of a surprise? Well HTC phones are usually dripping in its own skin for Android, the love-it-or-hate-it Sense UI. In fact, it hasn't launched a Sense-less Android phone since 2010's T-Mobile G2 handset. Indeed, the company recently admitted it was "very proud of Sense" and wants it to ship on every device. Android fans are often seeking more handets with pure versions of the operating system, beyond the Nexus series, so the 'Facebook Phone' could all of a sudden become an option for those folks. Check out the video below from around 6:30.